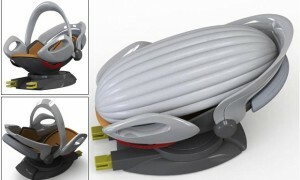 Original Post: The aptly named Carkoon seat aims to cocoon a child from danger in the event of a crash. It’s a rear-facing infant carrier that employs the latest airbag technology, combined with high tech materials, and aims to offer increased protection against the effects of a crash and any subsequent vehicle fire. If you have a crash, it even calls the emergency services, letting them know exactly where it is. The Carkoon is made of Kevlar, a high-strength, lightweight material, more commonly used on F1 racing cars than child car seats. In an accident, the seat deploys a Kevlar AirShield, which covers the entire seat in 50 milliseconds, effectively cocooning the child in a protective air pocket. The maker claims the covering can withstand impact from flying objects and is fire resistant. It has an emergency beacon transmitter which uses GPS to alert the emergency services of its location. The seat is a group 0+ seat, designed for children from newborn up to 13kg (12-15 months). Installation is rearward-facing, secured either using a car’s Isofix mounts, for which it has a quick release handle, or with the adult seatbelt. The seat isn’t in production yet, but when it gets there, it will be pitched at the premium end of the market, with an estimated retail price of £499. 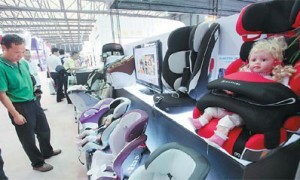 That makes it far more expensive than conventional seats from big-name brands like Britax, Mamas & Papas and Maxi Cosi. Jullian Preston-Powers of Carkoon told us that testing of the seat has been very successful so far, and that the company is hoping it will go on sale in spring 2013. When does arrive, be sure we’ll be adding it to our list for testing. Until then, you visit the Which? website to find out about the best child car seats for crash protection and ease of use – information you can’t find anywhere else.